During my first year as a young senior Mathematics teacher, I realised that most parents put a tremendous amount of pressure on their children to perform well in the sciences, especially Mathematics. Substandard results in other subjects were tolerated with much more patience and excused as a lack of studying (or time or self-discipline). As I didn’t have children of my own at the time, I had to revert to my Psychology textbooks to, firstly, comprehend, and secondly, to dilute this intense pressure from parents on my Maths learners. It turned out that most people have been influenced by the education system to believe that the only form of intelligence that is rated as “smart” is mathematical intelligence and maybe, linguistic intelligence. Scientists and writers… those are smart guys. I changed the structure of the next parents’ evening. I showed and explained the infographic below and sent the parents home with the message: “All children are smart. Which type of smart is yours?”. Gardner realised that what other scientists thought were just soft skills, such as interpersonal skills, were in effect types of intelligence. Many researchers and scientists soon agreed with Gardner as they could see the real-life logic in his theory. Being a smart mathematician gives you the ability to understand the world, but so does being “people smart”, just from a different perspective. Below is an overview of the Multiple Intelligences Theory, with some practical examples to guide you in your analysis of your own intelligence and that of your children. Naturalist intelligence or “nature smart” describes the human ability to distinguish among living things (plants, animals, etc.) as well as an understanding of other features of the natural world (clouds, rock configurations, etc.). This ability (or intelligence) was invaluable in our evolutionary past as hunters, gatherers, and farmers. It is still central in professions such as botanists, veterinarians or chefs. Children who are naturalists enjoy going camping and doing various outdoor activities. Travel bloggers who like going on adventures in nature are considered “nature smart”. Auditory-musical intelligence is the ability to differentiate pitch, rhythm, resonance, and tone. This intelligence enables composers, conductors, musicians, vocalists, and sensitive listeners to recognise, create, reproduce, and reflect on music. It is interesting to note that there is often a connection between music and emotion. But even more interesting is that mathematical and musical intelligence may share common thinking processes. Children that are “sound smart” are usually singing or drumming to themselves and more aware of sounds than others. If you want to cultivate the auditory-musical intelligence, you should surround yourself with music as often as possible and during activities like studying and exercising. A person with a good logical-mathematical intelligence can calculate, quantify, consider propositions and hypotheses, and carry out complete mathematical operations. People with this intelligence have sequential reasoning skills, observe relationships and connections, and make use of inductive and deductive thinking patterns. Mathematicians, scientists, and detectives are just some examples of professions where a high logical intelligence is usually required. Children with a high level of logical intelligence are interested in problem solving, experiments, and strategy games like chess. If you want to develop a higher level of logical-reasoning intelligence and be “number or reasoning smart”, you could play logic and pattern games like Sudoku, develop and prove a hypothesis, find the pattern in a poem, etc. A person with a high level of existential intelligence is “life smart” and usually thinks about deep questions about life. “What is the essence of our existence?”, “Why do we die?”, “How did life end up like this?”. These people have the capacity to tackle deep questions about human existence. Writers and philosophers normally show a high level of existential intelligence. Dr Gardner labels the ability to comprehend and relate effectively with other people as interpersonal intelligence. Effective verbal and nonverbal communication, the ability to recognise differences among people, sensitivity to the personalities of others, and the capability to hold multiple perspectives are among the skills attributed to these “people smart” individuals. Professions where this type of intelligence is dominant are teachers, social workers, actors, and politicians. Children with this kind of intelligence are leaders among their peers who understand others’ feelings and motives. Bodily-kinaesthetic intelligence is the ability to effectively handle objects and use a variety of physical skills in appropriate intensity and functionality. This intelligence also involves a sense of timing and the perfection of skills through mind-body unification. Athletes, dancers, surgeons, and craftspeople exhibit well-developed bodily-kinaesthetic intelligence and are generally called “body smart”. Linguistic intelligence is the ability to think in words and to use different languages to express and comprehend composite meanings. It is often referred to as being “word smart”. This strand of intelligence is found in people with an outstanding ability to understand the order and meaning of words, but also to apply metalinguistic abilities to reflect on their use of language. Linguistic intelligence is evident in poets, novelists, journalists, and public speakers and is the most widely shared human ability. Children with a high level of linguistic intelligence enjoy writing, reading, telling stories or doing crossword puzzles. Intrapersonal intelligence refers to the ability to understand yourself as well as your own thoughts and feelings. It also relates to the natural capacity to use such knowledge in planning and guiding your own life. Intrapersonal intelligence involves not only a gratefulness of the self but also of the human condition in general. This intelligence is evident in psychologists, spiritual leaders, and philosophers. These “self-smart” children may be shy, but they are superbly aware of their own feelings and show high levels of self-motivation. Spatial intelligence is the ability to perceive and comprehend in three dimensions. “Picture smart” people with high levels of spatial intelligence have advanced skills related to mental imagery, spatial thinking, image manipulation, graphics and artistic skills, and an active imagination. Professions that require good spatial intelligence are sailors, pilots, sculptors, painters, and architects. Children with a high level of spatial intelligence may be fascinated with mazes or jigsaw puzzles, or spend their free time drawing, playing with building blocks or daydreaming. 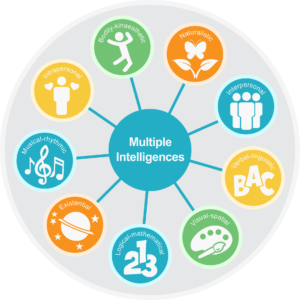 Knowing about these nine intelligences should empower us as parents and teachers to look at children (and adults) in a broader sense, knowing that each one has a dominant intelligence that should be focused on and developed.